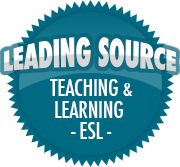 School | So, You Think You Can Teach ESL? The new semester begins (or maybe already began), which means new students, new teachers, new curriculum, and new parents to deal with! While it’s an exciting time of the year, it’s also a bit stressful too. Still, don’t let the stress of preparing materials and lessons, arranging the desks and classroom decorating take the fun out of the classroom! I was browsing a few great sites such as BusyTeacher, Oxford University Press, and Colorin Colorado for some ideas and found a few I really liked. I’d love to share them with you! Back-to-School Activities for ESL Students! If you’re teaching young learners (kindergarten through third grade), a great activity is a “This is Me” worksheet. This worksheet has students draw a self-portrait, and write down a few favorite things (like raindrops on roses and whiskers on kittens). This also works well with older students, too. You can have the students give more details about what they like and why. Another activity you can do is go over classroom vocabulary (desk, chair, whiteboard, computer, etc.) via Jeopardy. There is a great website to create your own Jeopardy game (for free!) at jeopardylabs. You can make a jeopardy game and send the link to your email for when you’re ready to use it! You can also make questions for older students to quiz their general knowledge or previously learnt material. One very important thing to do when you’re getting to know your students, is to establish classroom rules and make sure everybody understands them. While your school has their official policies in place, you can make your own as well to create a fun, engaging, and safe learning environment for all. The rules may be slightly different from the official rules, but have your students learn them and review them daily – at least during the first week or two – until they get them down. It may not be fun, but it’s vital to the overall classroom environment. At the beginning of the semester, have each student write down their goals for the year, and how they plan to achieve them. For young learners, one goal they can work towards is writing their names or memorizing the alphabet. They can also practice writing sight words or basic sentences on tracing paper. For older students, have them think about a goal for each area of ESL (reading, writing, listening, and speaking). They should put their goal sheet in an easy-to-see spot to remind them every time they see it. Do a scavenger hunt centered around a theme or topic. You can make little fact cards and post them around the room in different spots, and give students a sheet with questions. They need to find the different facts and write down the answers to each question on the sheet. For young learners, simplify it by using CVC words (sun, dog, leg, bat, pig, etc.) with pictures, and their sheet has the missing vowel they need to find. This can help build sight word recognition and also gets them moving! These are just a few activities I liked. For more check out these links below!